The Bodhi tree, a sacred tree ,the peepal , is a variety of fig, botanically Ficus religiosa under which Siddhartha Gautama attained enlightenment at Bodh Gaya; to become the Buddha. It has beautiful heart shaped leaves which glisten in the sunlight. Many sculptural depictions of the Buddha depict this tree. At the Mahabodhi temple in Bodh Gaya, a bodhi tree, believed to be the original tree’s descendant is worshipped by pilgrims. The tree at Shravasti where the Buddha performed many miracles, a bodhi tree called Anandabodhi is present. At Anuradhapura, Sri Lanka , the bodhi tree is believed to have been propogated from the original tree., known as Jaya Sri Mahabodhi. Buddha meditating under the Bodhi Tree, 800 C.E . Brooklyn Museum, USA. The Buddha sits under the Bodhi Tree, Borubodur, Indonesia. The Bodhi tree has many historical tales and happenings around it. It is believed that Emperor Ashoka of the Mauryan dynasty revered the tree in great measure and the spot was a holy site with a shrine in whose honour a festival used to be held every year. His queen grew jealous and tried to get the tree killed; but the tree grew back. The tree was again tried to be killed by King Pushyamitra Sunga in the 2nd century B.C. and King Shashanka in 600 A.D., but a new one was always planted in its place. A seed was taken from a fruit of the Bodhi tree at Bodh Gaya; as it fell from its stalk and was caught midway by Mogillana, a disciple of Buddha. It was planted in a golden bowl which grew very quickly and the Buddha consecrated it by meditating under it for a night. It was planted by Ananda, his disciple, in front of the Jetavana monastery at Shravasti. The tree that grew is called Anandabodhi. Worship of Bodhi Tree ,Sandstone, 2nd Century BC, Sunga Period, Bharhut, Indian Museum,Kolkata. Bhikkuni Sanghamitra , Emperor Ashoka’s daughter along with other nuns, took a sprig of the tree from its southern bough to Anuradhapura, Sri Lanks’s ancient capital where it grew at Malta meghavana (grove of the Great rain cloud) and was called Jaya Sri Maha Bodhi. It was planted in 288 B.C. The tree considered the most sacred, was worshipped by Buddhists who performed rituals near it, as it was believed to augur rain and have powers of healing and fertility. During Emperor Ashoka’s time , women looked after the tree and four royal maidens were chosen by him. They were bedecked with ornaments and would sprinkle water from golden and silver pitchers on the tree during the annual festival. The four maidens enjoyed great status at the king’s palace. The tree’s descendants are believed to exist in this area to the present day. Manuscript illustration, the Buddha sitting below the Bodhi tree, 10-11th century,Nepal/India. Bodhi tree, Bodh Gaya,1810, British Library,UK. Bodhi Tree, illustration, 1891, Anuradhapura,Sri Lanka. This entry was posted in asian art, Bodhi tree, Buddhist art and tagged Bodhi tree, Buddhist art on April 2, 2017 by historyreads. Vajrayogini is a female Buddhist deity, a tantric istadevata. She is capable of transforming the ordinary into the spiritual. She is a meditation deity in Vajrayana Buddhism. She is often called sarvabuddha dakini, the dakini who is the essence of all Buddhas. Her consort is Chakrasmavara. The term dakini is related to drumming in Sanskrit and means sky-goer in Tibetan language. In the Kathmandu valley of Nepal there are several important Newar temples of Vajrayogini. She has other forms like Vajravarahi and Chinnamasta. Vajrayogini is mostly depicted as a red young, strong female with a third eye of wisdom on her forehead. She wears a garland of fifty human skulls. She holds a driguk, a vajra-handled knife in her right hand and a kapala or skull filled with blood in her left hand, which she drinks from. On her head she wears a crown made of five human skulls. She stands in the centre of the blazing fire of exalted wisdom. Her right leg tramples the chest of the red Kalaratri and her left legs treads on the the black Bhairava. Vajrayogini, brass and gilt copper alloy, 18th century, Rubin Museum of Art, New York. 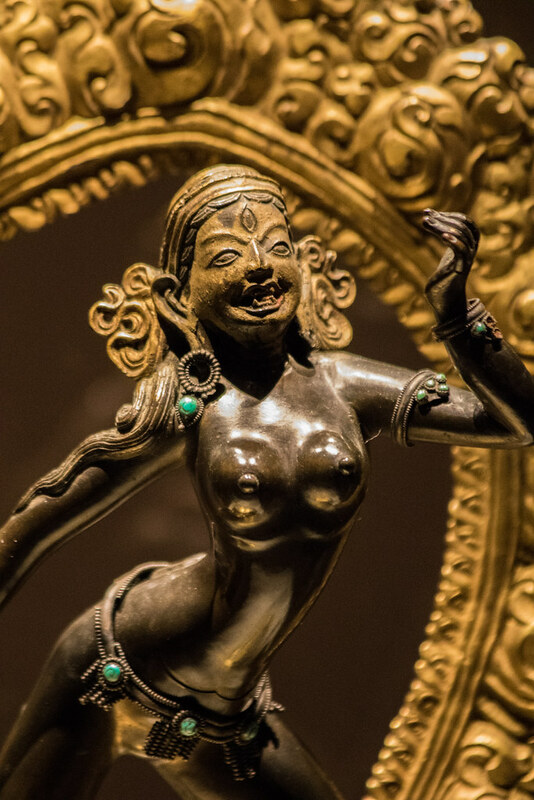 Vajrayogini , gilt bronze, 18th century,Nepal, Honolulu Museum of Art,USA. Vajrayogini with her red body symbolises her inner fire. She has only one face which means she has realised that all phenomena are of one nature in emptiness. She has three eyes which depict that she has the ability to see past, present and future. The knife she holds in her right hand can cut through delusions and obstacles of living beings. In Vajrayana Buddhism she appears in a mandala to her followers which they visualise according to a sadhana describing the practice of the particular tantra. Many collections have sadhanas connected with Vajrayogini but the guhyasamayasadhanamala contains only Vajrayogini sadhanas for practice. Vajrayogini ,Tibetan mandala,19th century, Rubin Museum of Art,USA. Vajrayogini or Sarvabuddha Dakini , copper alloy sculpture, early 19th century, Tibet. This entry was posted in asian art, Buddhist art, Dakini, Vajrayana Buddhism, Vajrayogini and tagged art history, sculpture, Vajrayogini on March 30, 2017 by historyreads. There are various mudras in Buddhism and Hinduism. A mudra can mean a spiritual gesture or symbolic mark. The mudras are non-verbal. Some important ones in Buddhism include the dhyana mudra, the bhumisparsha mudra, the varada mudra, the vitarka mudra, the abhaya mudra,the dharmachakra mudra, the tarjani mudra,the namaskara mudra,the buddha sramana mudra,the bhutadamara mudra among others. Each of these mudras have a deep significance and meaning. Mostly the hands and fingers are used to depict a particular mudra. The meaning of the namaskar or anjali mudra is a prayer position ; a bowing gesture. The attitude is one of devotion. A special gesture of Avalokiteswara when he has more number of hands. Buddha in anjali or namaskar mudra, Java, Indonesia. The abhaya mudra is one of reassurance, protection,blessing,; the word abhaya meaning fearlessness. The Buddha used this gesture while walking. In sculpture seated Buddhas too are depicted in this mudra. Seated Buddha in abhaya mudra ,Kushana period, Government Museum, Mathura. Standing Buddha,abhaya mudra, 20th century,Hussain Sagar Lake, Hyderabad. The bhumisparsha mudra or touching the earth symbolises the enlightenment of the Buddha,calling the earth as a witness to the event. This mudra usually has the left hand in the dhyana mudra. In this mudra Buddha overcame the obstructions created by the demon Mara. the Dhyani Buddha Akshobhya is often shown in this mudra. Buddha, bhumisparsa mudra, cloth painting, 19th century, Tibet, National Museum, New Delhi. Aksobhya, bhumisparsha-mudra, Borobudur, Java, Indonesia. The dhyana mudra is a flexible gesture either made with one or both hands. It is the mudra of meditation. This was the gesture of the Buddha before he attained enlightenment. The Dhyani Buddha Amitabha is depicted in this mudra. Buddha,dhyana mudra, Ming dynasty,(14th to 17th century), China, Museo d’Arte Orientale,Italy. The dharmachakra or vajra mudra is shown while depicting the Dhyani Buddha Vairocana. The Buddha used this gesture while preaching the first sermon in Sarnath. The dharmachakra means wheel of dharma. It symbolises teaching and preaching. Buddha,vajra mudra, 2nd century, Gandhara, ,Tokyo National Museum, Japan. Buddha,dharmachakra mudra, sandstone,Gupta period, (4th to 6th century), Archaeological Museum,Sarnath. The varada mudra is a gesture of giving and charity. It symbolises dispensing of boons. The right hand is used with the palm pointing downwards. 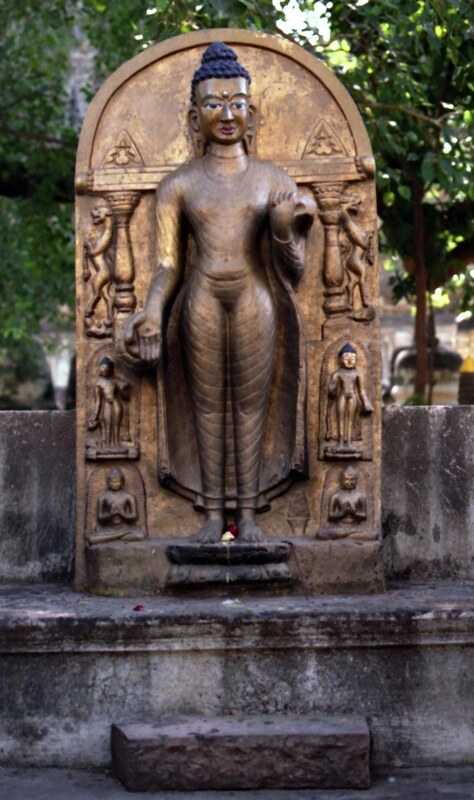 Standing Buddha,varada mudra, concrete,Bodh Gaya, Bihar. One of the lesser known mudras, is the tarjani mudra which is a gesture to ward off evil forces. In the depiction below the left hand is in tarjani mudra. The middle and ring fingers are folded while the other three are outstretched as shown. Standing Buddha,left hand in tarjani mudra, Pagan,Shwezigon. The vitarka mudra symbolises discussion,debate and explanation of the dhamma. In this gesture all the fingers are held upwards with the thumb and index finger tips touching, as depicted below. The miidle and ring fingers too can touch the thumb, in case it is the middle finger it depicts compassion and in case of the ring finger it depicts good fortune. Buddha,vitarka mudra,near Belum Caves, Andhra Pradesh. This entry was posted in asian art, Buddha, Buddhist art, Mudra and tagged Buddha, Buddhist art, Dhyani Buddha, Mudra on March 28, 2017 by historyreads. The word parinirvana refers to death which happens to the body of a person after attaining nirvana; a release from samsara , the cycles of birth and death and rebirth. This is different from an ordinary person dying, as per Buddhism.An ordinary person is reborn due to unresolved karma which passes on to a new birth. The pariniravana of the Buddha is mentioned and described in Buddhist literature. The parinirbanna-sutta is an important source in this regard. 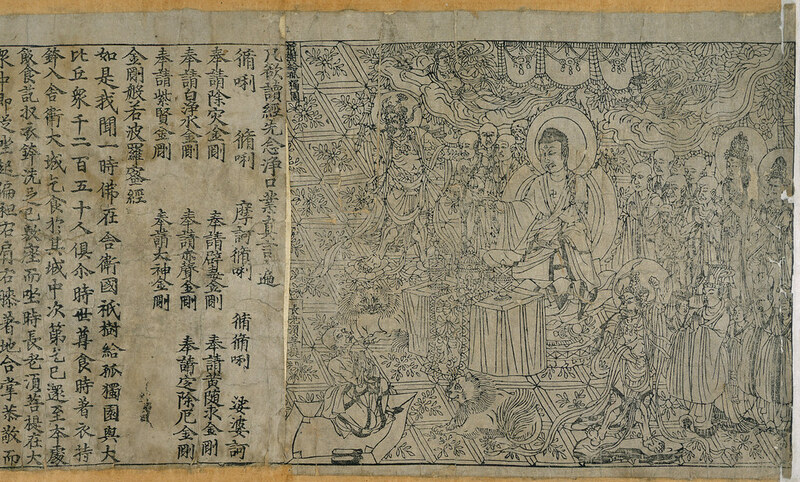 According to this source of the Pali canon the Buddha around the age of eighty declared he would soon reach parinirvana , the final deathless state. He had his last meal which was an offering from Cunda, a blacksmith. He fell violently ill after this and left his earthly body. The place is believed to be Kushinara or Kushinagar, (east of Gorakhpur in present day Uttar Pradesh) India, in abandoned jungles of the Malla kingdom. His disciple Ananda was against him achieving this state in the jungles. He also explained to Ananda that the meal had nothing to with his death, in fact it was a great meal as it was the last meal of a buddha or enlightened one. Before entering pariniravana he asked all the bhikkhus or monks to clear any doubts or questions they had. His final words were ” ..all composite things are perishable… strive for your own liberation with diligence..”After this he passed away into parinirvana. The Buddha had told his disciples to follow no leader. Mahakasyapa was made the chairman of the First Buddhist Council. His body was cremated and his relics were divided between eight royal families and his disciples. Much later Emperor Ashoka enshrined them in stupas. He built a stupa and made a pilgrimage site in Kushinara, the Gupta kings (4th to 7th century) further developing the site. 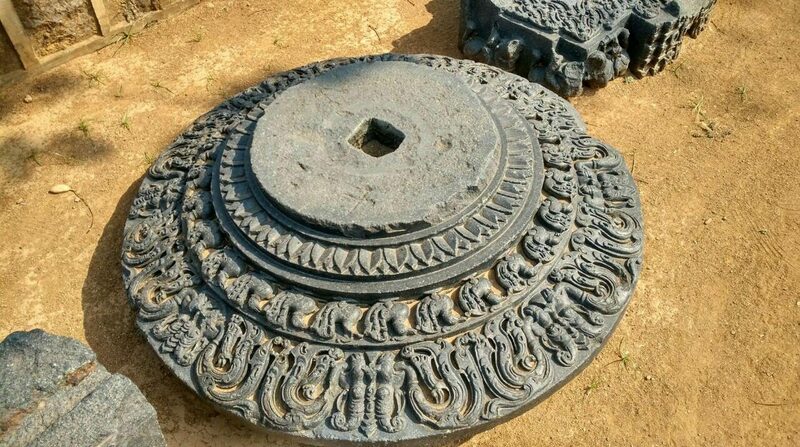 Kushinara had remained under the Mauryas, Shungas, Kushanas, Guptas and Harsha dynasties.The site had been abandoned around 1200 A.D due to invasions. It continues as an important pilgrimage site for Buddhism, following its rediscovery by British archaeologists in late 19th century. Pariniravana, painting, Astasahasrika Prajnaparamita Sutra, 700-1100,Nalanda, Bihar. Buddha, Gal Vihara,12th century,Sri Lanka. The painting below depicts the Buddha transitioning to parinirvana. Buddha is in a forest with Sala trees and surrounded by mourning animals, gods, demons, and human beings. This entry was posted in Ancient Indian history, art history of India, asian art, Buddha, Buddhist art, Gautama, parinirvana and tagged Ancient Indian history, Buddha, Buddhist art, parinirvana on March 24, 2017 by historyreads.